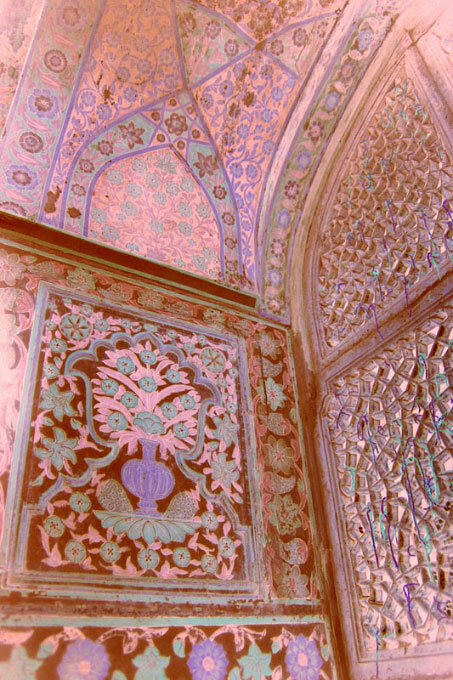 This shot is an interior detail of the Taj Mahal. This is a marvelous example of the merge between typical indian laticework to the right of the image, and muslim motifs in the form of arabesques. The colours are stone inlaid in the marble. Tied in the laticework, one notices green and purple strings. These silk threads are tied by visitors as they make a wish that is beleieved to come true when the threads disintegrate with the passing of time.